You finally found the perfect job, and you have been contacted by your potential employer to come in for an interview. How exciting! It is now time to follow up your impressive resume with an even more impressive interview. The first impression you make on a potential employer is critical. Your appearance can tell a lot about you, and what you are wearing will certainly be a factor when a potential employer forms his initial opinion of you. You are attempting to sell yourself when you first meet with a potential employer, just as you would attempt to market a product to a potential buyer. For this reason, it is crucial to dress professionally and look your best, even if the work environment is a casual one. Dressing conservatively is the safest bet, but it does not hurt to do a bit of investigating about the company to determine the type of attire that other employees wear. The best method of doing this is to visit the company before your interview date, either to pick up an application or to make interview arrangements in person. While you are there, take a look around and observe what current employees are wearing. Take notice of the types of attire worn by current employees, and note any differences between various ranks in the organization. Even if you discover that casual dress is acceptable, you should still dress conservatively unless specifically told otherwise by the person that will be conducting your interview. Dressing properly for an interview lets the potential employer know that you take pride in your personal appearance, that you care about the position for which you are applying, and that you understand the importance of professionalism. Under dressing for an interview may give a potential employer the impression that you do not truly care about the job, and that you are less experienced or qualified than you claim to be. Will dressing professionally result in a job offer? Not necessarily. Dressing properly for your job interview, however, will leave a positive impression on your potential employer and increase the odds that you will hear from that company again. Men and women should wear a suit if possible, preferably in a solid color, such as navy, grey, or black. Shoes should be conservative, and men should wear dark colored socks. Less jewelry is the safest route, and any jewelry worn should be simple and classy. Nails should be neat and trimmed, and women should avoid wearing brightly colored nail polish. Both men and women should be very careful not to wear strong cologne, perfume, or deodorant. Too much cologne is considered by many experts to be the number one mistake made when dressing for a job interview. Heavy makeup and brightly colored lipstick should be avoided at job interviews. Hats of any kind are no-nos as well. Do not leave your cell phone attached to your belt, and if possible do not bring it to the interview at all. If you have tattoos, consider covering them up. A potential employer may make an unfair judgement about your abilities or personality based on the number or style of your tattoos. As soon as possible before walking into your interview, spend a minute looking yourself over. 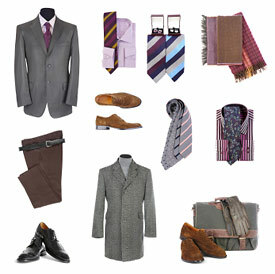 Make certain your clothes fit properly, your tie is straight, and your hair is not in need of combing. Spit out any gum you are chewing, and pop in a breath mint. Then, take a deep breath, and land your perfect job.